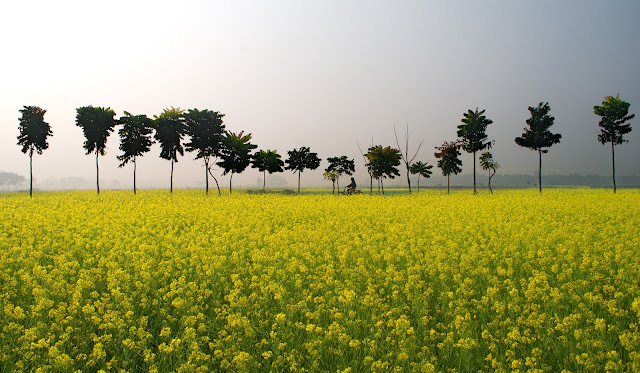 The winter is one of the six seasons in Beautiful Bangladesh. It comes after autumn and consists of Bengali months of Posh and Magh. In this post I will try to cover up the winter season in Bangladesh is really important for you as a Bangladeshi. Winter is a pleasant and dry season in Bangladesh. In winter days are shorter than nights. The season is cold but not cold like that in European countries. Winter is the season of fog and mists. Winter morning is usually foggy. The sun rises late, leaves of many trees dry up and fall. So the trees are bare of leaves and nature looks very dull. At the time of shivering cold, the old and the children bask in the sun. In the morning, they often gather straw and dry leaves to make fire and keep themselves warm. The rich remain comfortable with warm clothes. Winter is also the period of harvesting crops. Native cakes or pithas are usually made in winter. Green vegetables like cabbage and the cauliflower, tomatoes, potatoes and green vegetables are available in plenty. Date-juice is also available in this season. In this season people do not get tired of hard work. A lot of social festivities and exhibitions and outings takes place in winter. Communication remains in good condition as roads remain dry. Winter is a very entertaining season. Life becomes easy. The sun is not scorching. The wind blows gently. During this season the country seems to be clear and more bright. The presence of winter is interesting because of spring the queen of the season, follows it.